NEW YORK–(BUSINESS WIRE)–Barnes & Noble, Inc. (NYSE:BKS), the world’s largest retail bookseller, today announced the launch of Barnes & Noble Press, an enhanced and more user-friendly version of the Company’s self-publishing platform that makes it easy to publish eBooks or print books in one integrated platform. The redesigned site replaces the formerly-named NOOK Press. The new Barnes & Noble Press enhances the self-publishing experience in many ways, including increased royalty rates for eBooks priced at $10.00 and above, as well as additional trim size options for print books. Barnes & Noble Press also continues to give qualified authors the opportunity to apply for signings and events at Barnes & Noble bookstores, as well as giving select authors the opportunity to sell their books in stores. Publishing is a business, and—SURPRISE—so is being an author. By definition, anyone who decides to go pro is automatically an author business. ‘Business’ is what separates the hobbyists, dabblers, amateurs and wanna-be’s from true professionals. I can already hear the great gnashing of teeth. Calm down. *hands paper bag* Breathe. One of the main reasons emerging writers fail to see any fruits from all their efforts is a lack of foundational knowledge. What does the author business actually entail? Not nearly as much as one might be led to believe, which we talked about in my last post What Chef Ramsay Would Say About Writing. When we add the word business to author our thinking shifts. To succeed in business it’s critical to first define it (known as a mission statement). What IS our business, and what does it DO? Here’s a gift that’s perfect for small business owners, a nonprofit that needs publicity, authors who want to sell more books, or anyone who wants to self-promote on a shoestring budget and without an expensive publicist. 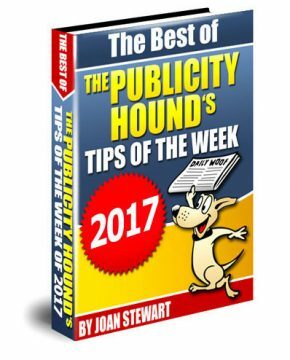 It’s “The Best of The Publicity Hound’s Tips of the Week of 2017,” an ebook that includes 24 tips from my popular email newsletter. I’ve been offering this ebook as a holiday gift since 2005. My subscribers love it because most of the tips, tricks and tools are for those on a tight promotions budtget. And the ebook is a helpful reminder of promotion they might have put off earlier this year. How Authors Can Snag 1 Million Page Views: Guaranteed! January 19, 2018 8:40 am / 3 Comments on How Authors Can Snag 1 Million Page Views: Guaranteed! Many authors want to sell lots of books, get media attention, win awards, hit a best-seller list, and impact society with their books. Lots of writers will employ a social media strategy that contributes to marketing their books and promoting their brand. Can any author achieve a significant milestone, such as snagging one million page views for a website or blog? The answer is most definitely yes, but the bigger question is: How long will it take you? Within five years of launching my blog, www.bookmarketingbuzzblog.blogspot.com, I reached 1,000,000 page views. The blog, now six-and-a-half years old, features nearly 2,600 posts and will surpass 1.5 million page views this spring. For some, they would love to average my traffic of 25,000 page views per month. For others, it’s too little and too slow. They want to blow the Internet up. Today. Now! If you plan to write more than one book your book marketing serves as more than just a sales tool. Successful, full-time indie authors use book marketing to promote their brand and keep their titles top of mind for their current fans, and to draw in new buyers. Plus, the most effective book marketing approaches don’t simply push product, they create a connection with fans that keep them coming back for more. There’s only one you. Hear me out, because as an indie author, it’s your strongest selling point, if you play your book marketing cards right. Every author has written a book. So what sets you apart? Your brand. Yes, as an indie author you need to think of yourself as a small business and a brand. And one of the best ways to establish your author brand and cement reader loyalty is through imagery. Welcome to January’s content ideas for your indie author book marketing! Plan to make 2018 your best content year yet – because without those regular connections with your fans and followers, without putting yourself out there, you’re just another book on the shelf they’re not connected to. There’s something about the New Year that inspires people to set goals for themselves. Authors take note: other than aiming to finish your next book in 2018, commit to tracking your reading habits by participating in the Goodreads Reading Challenge. The Goodreads Reading Challenge allows you to set a goal for how many books you want to read this year, and then helps you keep track of that goal. Last year, more than 3 million readers participated in the challenge and pledged to read 3.4 million books. At the end of the year, Goodreads creates a compelling infographic for each member with stats on the books and fun badges that the member unlocked along the way. If your content doesn’t resonate with your audience, they won’t follow you where you want. If your content doesn’t resonate with your audience, they won’t follow you where you want to take them. The key question is: What kind of content universally resonates with people? Learn to create content that users desire above all else. Learn to create content people love! If you want more readers for your books … if you want more people talking about your books … if you want more people following your blog or social networks, then learn how to create content that users desire above all else. Learn how to create content people love!